Tolerates more sun in northern zones. 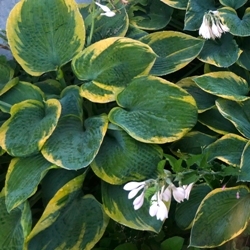 Hosta Wide Brim is a medium sized Hosta. It has wide, corrugated leaves with dark, bluish-green centers and wide, irregular margins of pale buttery yellow turning to cream. In mid to late summer buds open to pale lavender flowers on 24" stems.